‘More services and less cost’ are the key to success in the broadband services market: Patrick Conway [Sales Director] of Virtual Access talks to InterComms about his views. Q: What do you see as the barriers to entering the [broadband] market? A: There are two key challenges, but these can be overcome. 1. High level of competition. There is a lot of competition in the broadband market, and service providers need a way to differentiate their services if they are to be successful. The Virtual Access platform allows the innovative service provider to differentiate its offerings by supporting a wide range of revenue generating services on a single, centrally-managed platform. 2. Potential costs. Many service providers considering the introduction of managed broadband services are concerned about the costs and risks associated with new service development. The risks include underestimating the call center, engineering and field staff requirements required to deliver these services. This means a longer return on investment, poor customer satisfaction and long delays in service introduction and roll-out. Virtual Access addresses these challenges by offering a centrally-managed solution that takes responsibility for service delivery without the need for site visits. Automated, “Zero Touch” provisioning gives the service provider a fast track to market without the costs and risks normally associated with the introduction of new services. Q: How are you addressing the market? A: Businesses are increasingly outsourcing IT and communications support, which allows them to focus on their core capabilities and reduce costs. Virtual Access has designed its platform to enable service providers to profitably meet this demand, while providing the quick and effective support that is essential to retaining customers. ·	Key components of the product portfolio that providers can deliver using the Virtual Access platform include the following managed security services. 1. An equipment and software-based solution that enables the service provider to use its in-house resources to launch and operate new managed services using Virtual Access technology. 2. A turn-key wholesale service that gives the service provider a fast track to market where outsourced network operations and second-line support are provided by Virtual Access on a private-label basis. The service provider can then move the service in house, if desired, once the service is fully operational. Q: Can you outline the key features of your Zero Touch solution and what its advantages are? A: There are two main advantages. First, a wide range of revenue-generating services can be supported on a single platform. Second, it increases the service provider’s profitability by reducing the cost of deploying and operating managed services. Specifically, the Zero Touch solution is customer-installable and centrally-managed, which means zero truck rolls to debug on-site problems. For example, Datacom Partner is a Dutch service provider that deploys and manages IP VPNs worldwide without the need for in-country site visits. A case study has shown that the Virtual Access solution provides a sixty per cent reduction in operating costs compared to alternative solutions. Q: One of the components in this solution is your new GW4000 Series Service Managed Gateway? What does this bring to the table? A: We developed the GW4000 to provide a number of features that improve reliability and enhance the services offered on our platform. Integrated V.90 and ISDN backup are now provided, with GPRS backup expected later in 2004. This increases the reliability of customer network access in case of DSL line failure, providing a level of redundancy that SMEs have previously not enjoyed. Secure broadband sharing capabilities provided by the GW4000 mean that up to four completely isolated LANs can be supported by the device. In addition, it provides VLAN support and extra memory for our content filtering features. Q: How do you see the market for Managed Security services growing in the next few years? A: There is growing demand from all sectors for network security in an Internet world. Corporates and SMEs alike are recognising that they need to protect their data assets and, in some cases, business liability issues are driving the market. For example, in the case of the U.S. government's Health Insurance Portability and Accountability Act (HIPAA), the increased need for privacy and demand for enhanced security technology is driven by regulation and legislation. In addition, the more general trend toward the internetworking of businesses electronically in the form of commercial extranets and other VPNs is now mainstream. In Europe, work undertaken by Forrester Research suggests that the region's Managed IT Security market will grow to Euro 4.6 billion in 2008. Forrester expects that SMEs will account for 66% of managed security spending by that time, and that Managed Firewalls will claim 36% (1.7 billion Euros) of the total managed security market. Q: What is the profile of your target market in the Managed security sector? A: Our key market is Internet Service providers and Telecommunications providers delivering managed services to: Small/Medium Enterprises, Corporates with Remote Branch offices and Corporate Teleworkers. Q: How would you provide a range of layered Internet Security Services? A: The first step towards security for SMEs and other businesses is a managed Firewall service, providing basic perimeter security. The next level is the Managed IP VPN, which providers can use to serve the Corporate Remote/Branch office and Teleworker markets. VPNs can yield lucrative opportunities for managed site-to-site networking and secure workforce mobility services using mobile VPN client support. Another managed security service that can also boost productivity is Content Filtering. Many SMEs provide Internet browsing facilities to their employees, but these are open to abuse that can result in productivity loss and potential lawsuits from the display of offensive material in the workplace. Consequently, Content Filtering is becoming an increasingly vital service bringing peace of mind to employers. Q: What is the outsourcing proposition that Virtual Access can make to potential users? A: With our outsourced proposition, the service provider adds Virtual Access services to its portfolio and Virtual Access delivers the service to the end user. The service provider owns the customer relationship and sells the services. Virtual Access owns the CPE, logistics, automated provisioning, management systems and support responsibility. Q: What do you envisage being the benefits to the Service Provider? A: Service providers are concerned about the costs and risks associated with launching a new service, and Virtual Access provides a solution to this problem by offering a wholesale package that takes responsibility for service delivery. This way, the service provider can bring new services to market at a fast pace with little in the way of upfront costs. Q: Why Virtual Access technology? A: Our patented “Zero Touch” technology significantly reduces the cost of deploying and maintaining managed communications services. This is achieved by providing a customer premise-based platform centrally provisioned and managed by our Activator server. For total process automation, Activator can be integrated into existing provisioning/order entry systems. The CPE is plug-and-play and automatically contacts the Activator for configuration and software at startup. Our patented provisioning process enables service providers to offer complex services on a mass scale without having to send staff to the customer site. Q: How successful has Virtual Access been in the market? A: Virtual Access products and services operate in over twenty countries worldwide. We have a track record of providing mission critical communications in some of the most demanding environments, including many of the world's leading communications providers. Customer references are available on request. Q: What are the underlying revenue projections that you are using to make your ROI case to service providers? A: With a relatively modest user take-up of 20 sites per month, we would expect a revenue stream of €1 million per year within two years. These revenues are scalable in that a take-up of 100 sites per month would result in a revenue stream of €5 million in the same period. The profit margin depends on the solution or service purchased from Virtual Access. We have made the following assumptions in our projections: The average take-up is 20 sites per month, including 70 percent using managed Firewall services and the remaining 30 percent using VPNs. The end-user pricing from the service provider for firewall users is €120 each month with a one time set up fee of €120. In the case of VPN services, the monthly revenue per-site is €160 with the set-up fee remaining the same. Q: What is the key for providers to obtain a return on investment in the sector? A: Broadband services can and will deliver substantial revenue streams on the basis of an initial fee and recurring monthly charges. However, service providers will need to find a cost effective delivery mechanism to maximize customer satisfaction and return on investment. 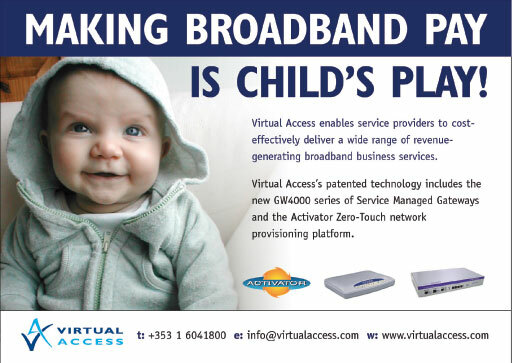 The Virtual Access patented ‘Zero Touch’ platform meets this requirement by providing a solution that allows the service provider to cost-effectively deliver a wide range of enhanced, revenue generating services that go well beyond a commodity Internet access service, and position the provider as a trusted partner to its customers.